Chinese have for the first time become the largest group of international visitors to HCM City, according to the municipal Department of Tourism. Their number soared to 600,000 last year, a year-on-year increase of 50 percent. In 2016, they were the third largest group, La Quoc Khanh, Deputy Director of the department, said. Chinese visitor profiles have changed, requiring his department to do market and product research to help travel firms tap this growing market segment, he said. The city would then develop appropriate tourism products to serve Chinese tourists, he said. Nguyen Quoc Ky, General Director of giant tour operator Vietravel, said tourism authorities should rearrange their priority markets for running promotion and marketing programmes in 2018-20. China should be a priority market, followed by Northeast Asian and Southeast Asian countries, he said. Ty Quy Thanh, Director of Lien Bang Travelink, said his company saw a 30 percent increase in the number of Chinese tourists last year. The number of bookings from China in the first quarter of this year rose by 15 percent year-on-year, he said. 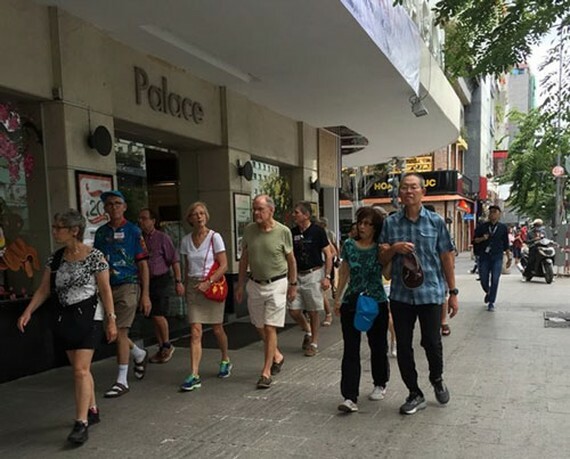 Tours of three to four days to HCM City and the Cuu Long (Mekong) Delta or beach cities such as Vung Tau and Phan Thiet are the most popular, he said. Phan Dinh Hue, Director of Viet Circle Travel and Service Company, said most of the Chinese tourists visiting HCM City come by air. They are from major cities such as Shanghai and Beijing and have deep pockets. To encourage spending by these visitors, the city should develop more shopping places and onsite services to serve them, he said. Travel firms said a shortage of four- and five-star hotels and Chinese-speaking tour guides are major obstacles during the tourism high season and holidays.